Monsters? There are no monsters here. How do you know? The SleepIQ Kids bed will keep you safe from monsters and also give your kids a better nights sleep. Taking a cue off the x12 smart bed, the SleepIQ Kids bed from Sleep Number helps children get a better night sleep in a bed that will adjust to their growing needs. Sleep Number announced this new bed at the 2015 International CES show in Las Vegas. We got a first hand look (or more like first body feel) of the SleepIQ Kids bed. The bed contains multiple sensors that pick up on motion and pressure. The bed can give you data such as how the child is breathing or if they are having issues such as nightmares or waking up in the middle of the night. 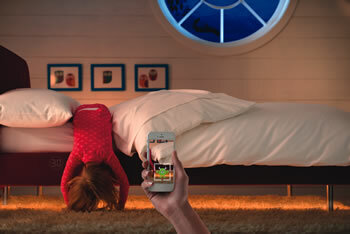 The sleep dashboard (Android or desktop app) will give the parents an idea of how the child is sleeping. The bed also has a nightlight mode if he/she needs to get out of bed to use the bathroom or find their favorite plush doll to snuggle with. The light will turn off after a while so the kids can fall asleep first. And the SleepIQ Kids option also comes with a monster-proof option. The lights turn on and your child can look under the bed, or just get a reading from the app so they know the room is monster free. As the child grows, the bed will adapt to them. Once they turn old enough, they will be able to manage their own SleepIQ score. The app also goes beyond the bed to help them make better choices as they grow – how much sugar they intake, TV time they watch and more.